Well, there will be another post on 90's knitting, now back to the war years! Though I love the detailing on the 30's garments the 40's are my favorite fashion era. I love the fitted silhouettes, pronounced shoulders, the just-below-knee-length A-line skirts and that all of that is just perfectly flattering for my body type! The only thing I don't like is the extreme high necklines of the era. 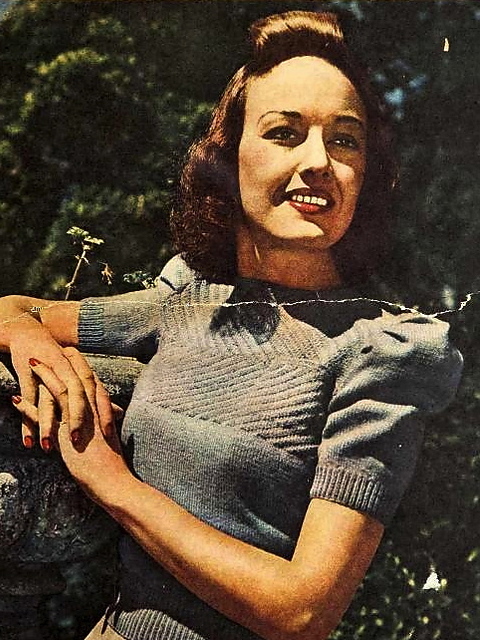 I've always wanted an early 1940 style sweater (jumper) with a fitted bodice and puffed sleeves! Since I am very much into knitting these days I choose my first vintage pattern from the Australian Women's Weekly magazine. did you know that......You can find a lot of free vintage knitting pattens on the internet? Although it might be tempting to start 'hoarding', you don't have to buy anything but the yarn to get started. This jumper is interesting because the simple yet effective diagonals at the front. I'm starting to sound like the AWW, do I? I love how simple the pattern looks, just knit and purl diagonals. And what do you think of the tiny, decorative breast pocket? The otherwise fitted sleeves are arranged in puffy pleats at the shoulder seams. Exactly what I was looking for! A versatile sweater for all occasions. See it photographed in a natural color on the cover of this issue." I kinda miss the detailed description...but love that they named all of the patterns they published throughout the 1940's. In the next post more about the choice of yarn.